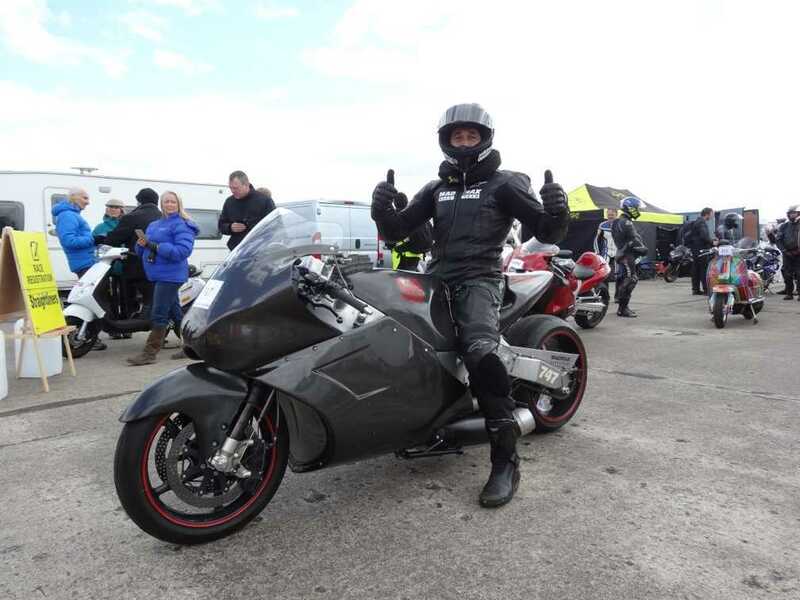 NEW Turbine Bike World Record – 234mph - Standing mile! | Racing | Eisenberg Racing - Max Your Life. Having arrived at the event Friday to set up and get organised, the weather forecast for Saturday was looking unattractive – dry, but strong cross winds straight across the track with gusts of up to 20mph makes land speed racing very dangerous, especially with fairings, that act like a sail and can blow you straight off the track before you can even react. 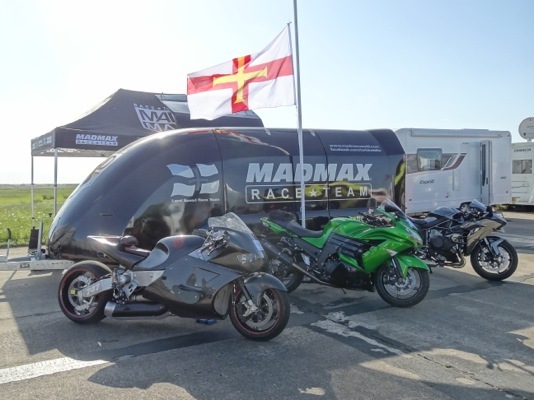 I did several runs, with top speeds around 220mph, but it felt very dangerous, with the bike crossing the finish line at 19 degree of lean! My support team were excellent, checking every part of the bike after every run, ensuring safety was top priority and checking the data to notice any trends. Sunday morning was looking much better, the cross winds had changed direction to light to breezy head winds. Not ideal, but far safer. 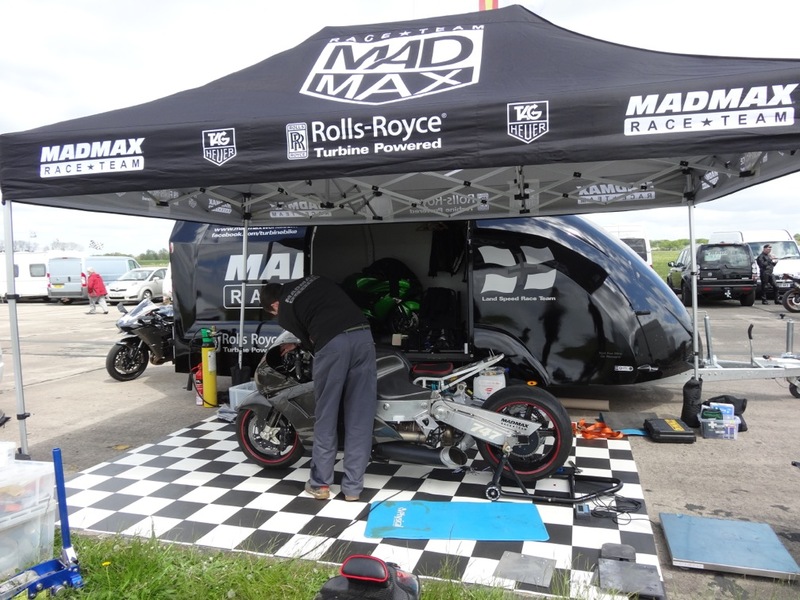 First run was a gentle 223mph, followed by each run, increasing the speed, until 3 runs in we achieved a new Turbine bike world record of 234mph in a head wind of around 10mph. This was done in a mile from a standing start. A new British flying 1/8th mile record was also set at 220mph. Zef Eisenberg “It was a tiring weekend, with every few mph gained being a combination of checking data, suspension settings, ballast and fuel settings. I always forget how hard setting new records is, until the race event. 470-480hp continuous horsepower with water/meth boost allowing 563hp. Powered by a Rolls Royce C20W shaft turbine from the Augusta 109a helicopter. Multi fuel: Jet-A, kerosene, Petrol/Diesel combination. Bespoke Built in the little island of Guernsey.